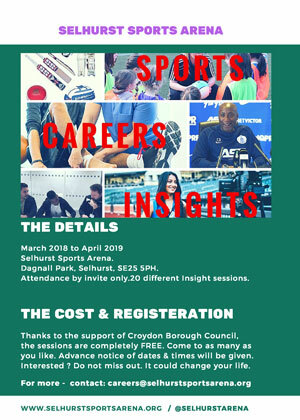 There are tens of different sporting careers related to a young person aged 16-25 could consider to earn a decent living via and thanks to Croydon Council, Selhurst Sports Arena will be introducing FREE Sporting Insight Career sessions, so you can find out more. 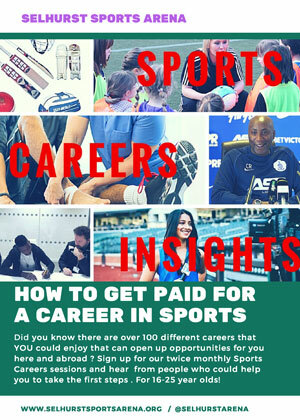 The Sessions will be held twice a month starting in March 2018 and examples of Sports Careers covered are Sports Agents, Physiotherapy, Sports Goods Distribution, Coaching, Refereeing, Sports Photography, Sports Events, Media & Marketing and more. There will be no charges to take part and you will be able to hear from Guest Speakers in the Career insight topic of the session. Plus we will show you the first steps you can take towards the career the session has just covered. To register your interest in being notified about these sessions and to be invited to take part please send an email to careers@selhurstsportsarena.org and include your full name, contact phone number(mobile) and confirmation that you are aged between 16 and 25.